Your family is taking a weekend trip to Long Beach Washington for the three day weekend. 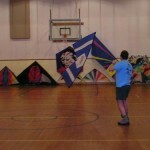 When you pass the bank, you read the sign that says, “Windless Kite Festival! Jan. 16 & 17” You think, “How is that possible?” and decide to check it out. It was a great weekend that started Friday for some people, Saturday for everyone else. For those of us who showed up on Friday, there was a lot of fun going around. We haven’t seen each other since September and we were all happy to get reacquainted. People were doing different things. Some of us were talking, some were flying. 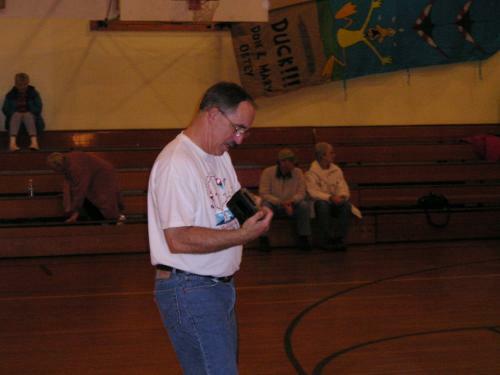 The older generation was on the court practicing for the next day’s competition, yes I said court. 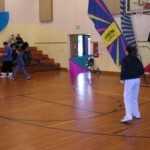 We were flying in an elementary school gymnasium which wasn’t very big at all. The ceiling was just tall enough to fly under. Saturday started at 6:30AM for a few people who met at Laurie’s for breakfast. From there, we went to the gym to start practicing for the afternoon. At around nine o’clock , people started flowing in and out of the gym to see the happenings of the day. Working hard all morning with practicing and showing people how to fly was Jerry Cannon. 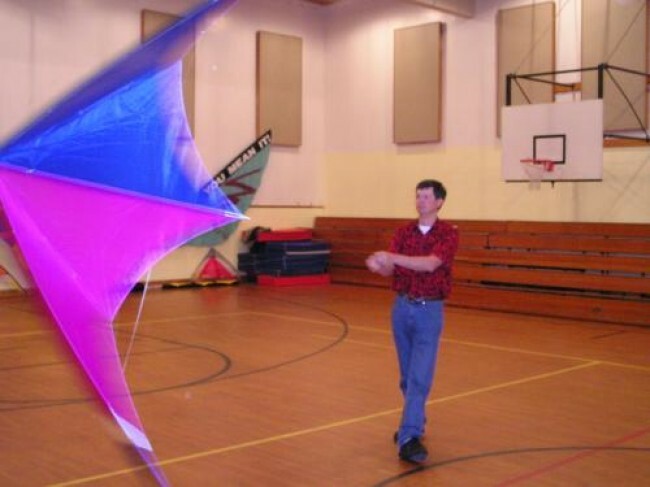 When he wasn’t practicing or taking a break, he was showing others how to fly indoors. 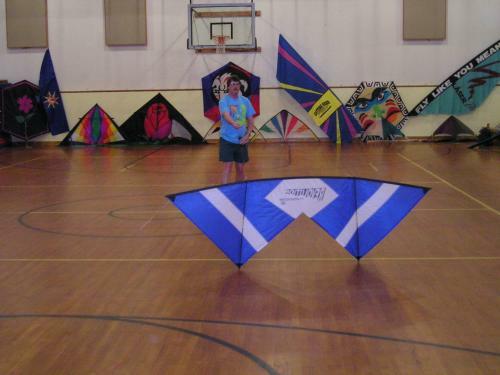 Jerry is a master flier outdoors and one of the best indoors. He spent a lot of time with one girl that was so interested in learning that she left the gym a better indoor flyer than I am, (I’m still practicing though!) 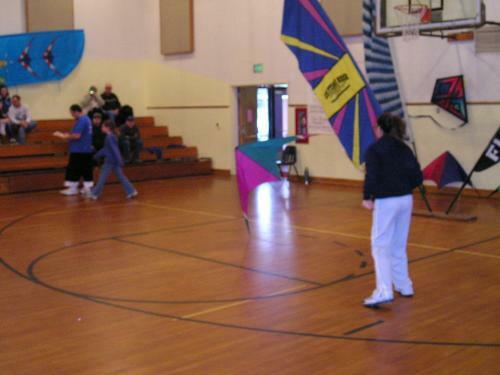 There were quite a few people who learned how to fly and asked where they could find an indoor kite. When two o’clock rolled around, it was time for the competition to begin. The competitors for the year were Jerry Cannon (last year’s winner), Wayne Turner, Scott Davis, Jeff Reed, Alan Cunningham, Lauren Davis, and Penny Lingenfelter. 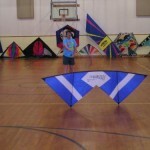 It was a great competition with a variety of music and a variety of kites being flown. There were Wrens being flown, a Breeze, a Baby Tramantana, Indoor Revolutions, and even an Outdoor Rev. After about an hour, our competition was over and it was once again free fly time until about five-o-clock when we started getting ready for the banquet where the awards would be presented. Our banquet was an Italian potluck where everyone brought one item for dinner. After everyone had finished eating and cleared away, we handed out the awards which didn’t take very long since there was only one event. We had seven flyers for the event. There were awesome scores all around. 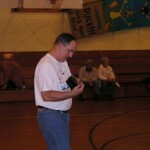 The top three in order were Wayne Turner, Jeff Reid, and Scott Davis. 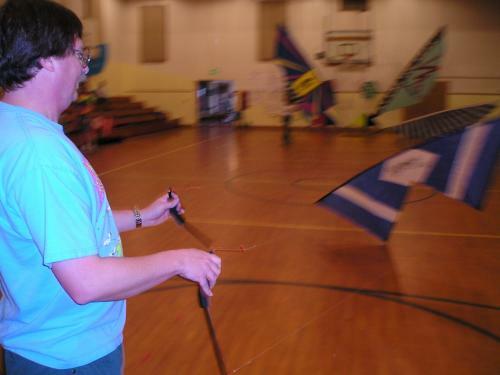 We had three flyers that had never competed indoors including Jeff Reed who was flying fighter kites. 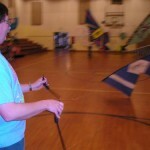 We also had one competitor, Lauren Davis, who had never competed before at all. Lauren is twelve years old and yes, she is related to the wacky and loveable Scott Davis who is her dad and Brian Davis who is her brother which all really go to show you that this really is a family sport. After the awards, we had a bag raffle of which the proceeds went to the World Kite Museum . The main goal of this weekend was to earn money to go to the museum for the new building and exhibits that will be there. The approximate total that went to the museum was three hundred dollars just from the bag raffle and then there was also a donation jar that I do not know the total of. Hopefully the museum will be built in a few years and everyone who travels to Long Beach will go and see it. For more information, or if you’d like to donate to the World Kite Museum go to worldkitemuseum.com. On Sunday, we had one more competition left, indoor hot tricks. I was excited to see this because I had never seen one before and wasn’t sure how things were going to go. We had lots of people in the gym watching our four competitors go head-to-head trying to win the title of indoor hot tricks champion and fifty dollars. Our first round put Jerry Cannon against Wayne Turner and Scot Davis against Penny Lingenfelter. Our winners for the round were Wayne and Scott but Jerry and Penny put up an awesome fight and deserve credit for competing. In the final round, we saw both Scott and Wayne give it their all to win but only one person could. It was a five to four split with the judges and on top was Scott Davis. I give credit to both men for making it to the finals. After hot tricks, we had six people sign up for demos and do an awesome job. There is however one demo that stands in my mind. 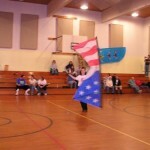 Have you ever been watching someone fly to a song and see the audience stand and in honor of their country? If you would have been there, you would know what it’s like. Penny Lingenfelter flew one of the greatest, most patriotic demos I have ever seen flown. 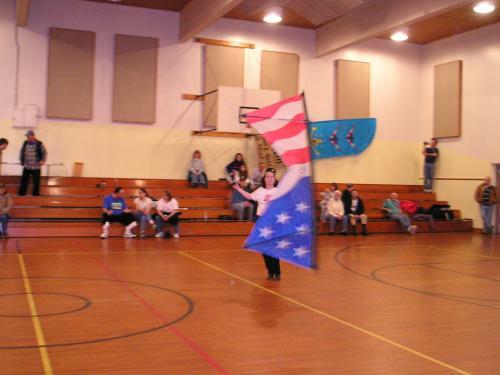 She flew her United States flag Revolution to the song “God Bless the USA .” I saw at least fifteen to twenty people stand up and solute, or put their hands over their hearts as Penny flew. I was one of the people standing. I had goose bumps. At that moment I was the proudest American there is because without the men and women fighting for our freedom and those who already have and lost their lives for it, we wouldn’t be doing what we are now. We wouldn’t be together with the ones we love. If you ask me, I would say that was the perfect ending to a weekend that had already been amazing. In a year’s time, I will be back in Long Beach Washington, on Doctor Martin Luther King Junior’s birthday weekend doing the same thing I was this weekend. Helping earn money for a cause that will benefit what I do, as well as being with friends, family and the ones I love. What a weekend!!! 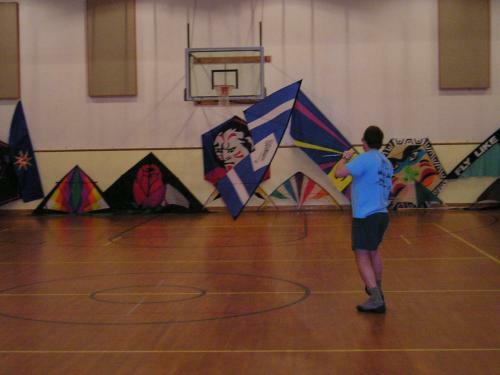 This entry was posted in 2004, Competition, Events / Festivals, General Topics, Indoor Kiting, Issue 34 (Jan/Feb), KL Archive, Reports and tagged festival, indoor, long beach, washington, windless.